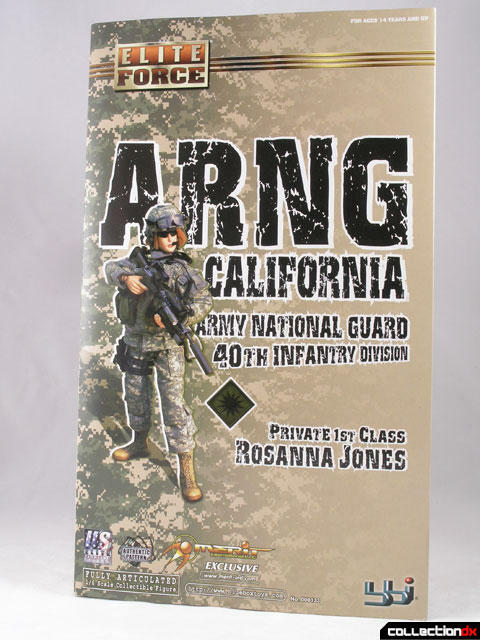 Home » 2007 » California Army National Guard 40th Infantry Division "Rosanna Jones"
California Army National Guard 40th Infantry Division "Rosanna Jones"
One of the great things about owning a toy review website is that I occasionally get the opportunity to review toys that are otherwise out of my collecting scope. 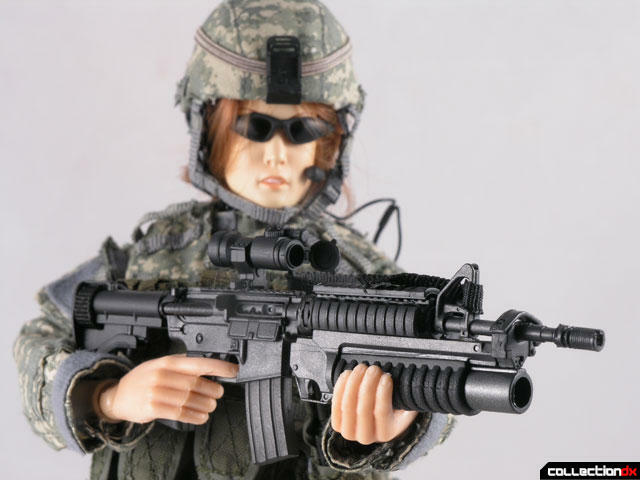 While I don't mind the odd 1/6 scale figure, I almost never get into Military toys. I completely support our troops, but I never felt like collecting them. With any review of a toy I am not familiar with, the first step is always research. The internet is a wealth of knowledge, and anyone can become an expert on almost anything if they know how to search properly. 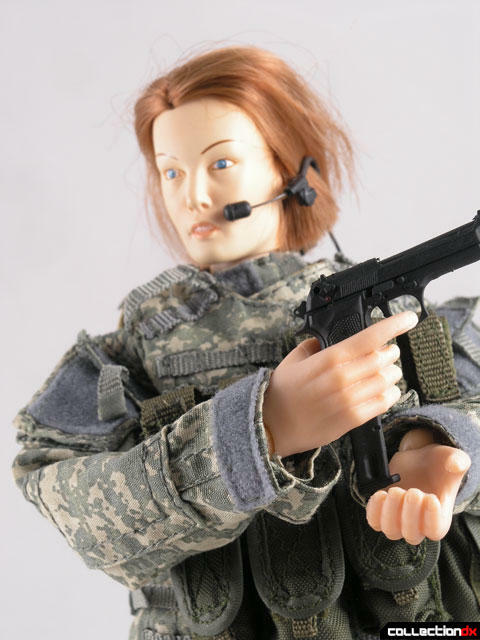 Well, within a few minutes of searching for information about Elite Force's Rosanna Jones figure, I realized I was in way over my head. 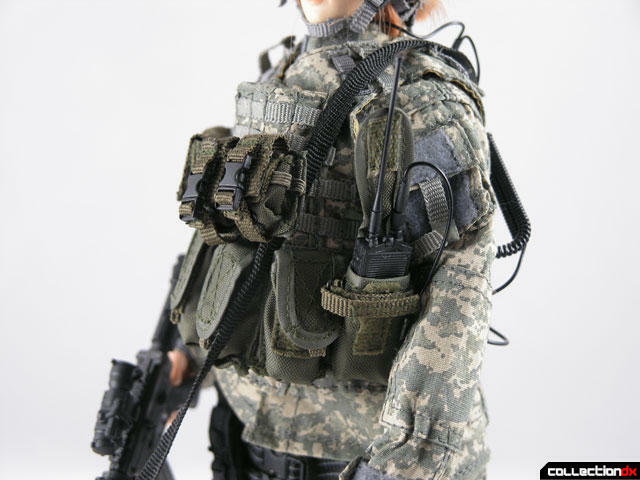 I stumbled across a few 1/6 figure forums and realized that these guys are serious about these figures - they know the name of each and every piece of equipment the figure carries, and whether or not it is accurate to the actual piece of hardware used in the field. I'm not going to pretend that I know what all of the parts are called - if you are into these figures then you probably know already, and it has been covered elsewhere. 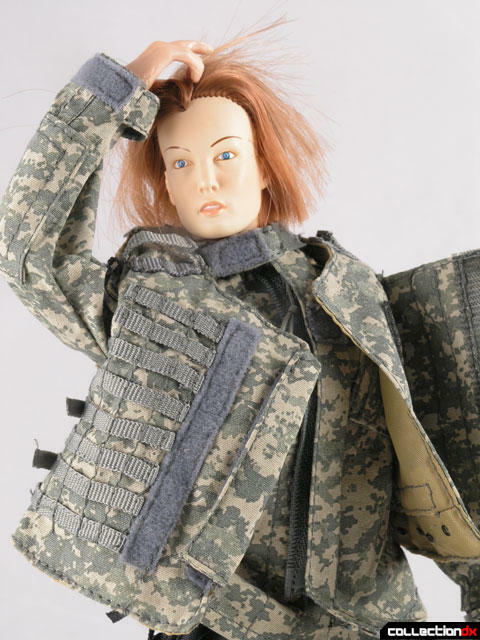 I am going to tackle this review from the standpoint of someone who does not collect 1/6 scale or military figures. 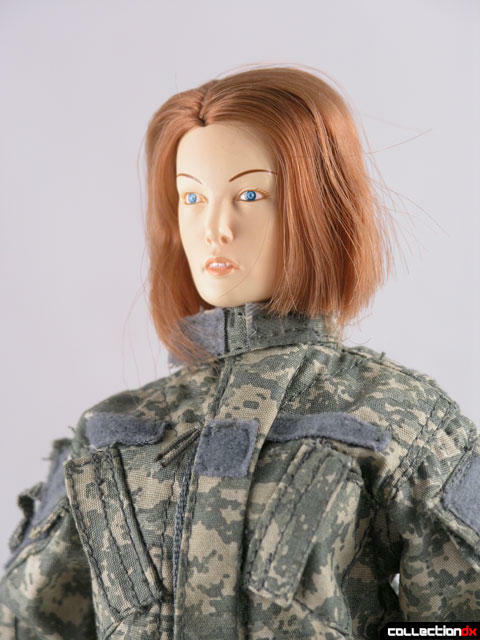 California Army Nation Guard 40th Infantry Division "Rosanna Jones" is a new figure from BBI (a sub copany of Blue Box Toys). 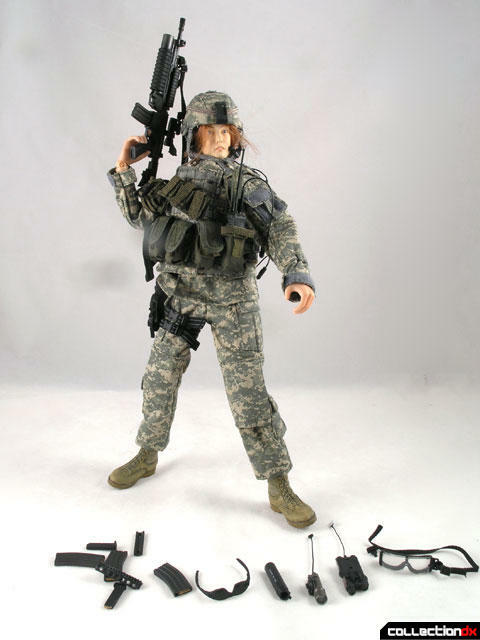 It is part of the Elite Force line of figures, and this particular figure is sold exclusively by Merit International. 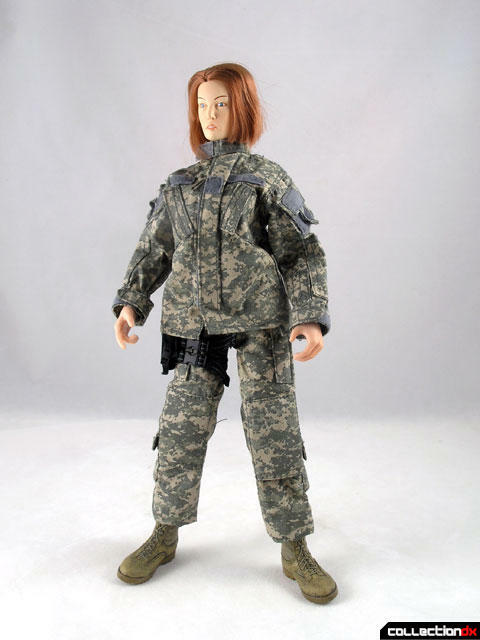 Rosanna Jones is, as far as i can tell, one of the first 1/6 scale military action figures from BBI. BBI previously did female figures under their "Cool Girl" line. The selling point of the Elite Force line appears to be their realistic styling and accessories. 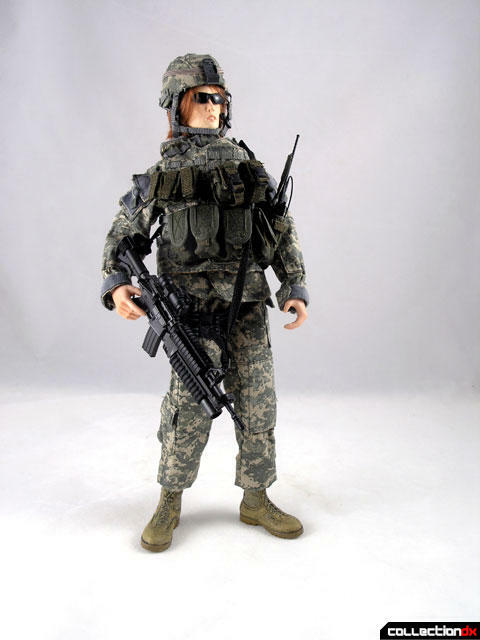 Each figure comes with an authentic uniform and in-scale weapons. 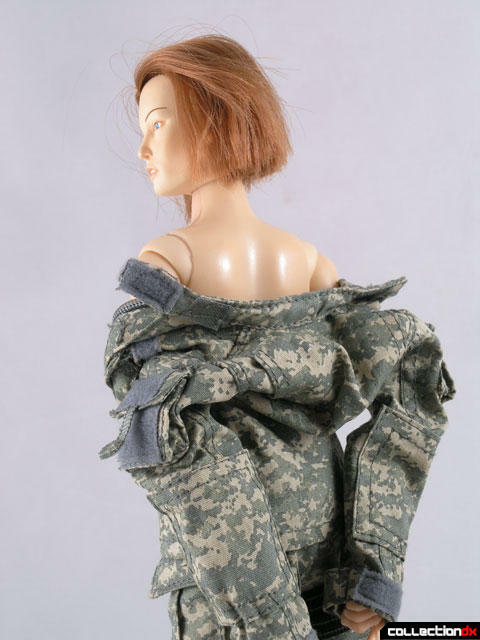 The uniform here features the army’s newer digital camouflage pattern. The jacket is made out of cloth and is secured in the front by a strip of Velcro. The pants are also cloth and each of the pockets open with Velcro flaps. 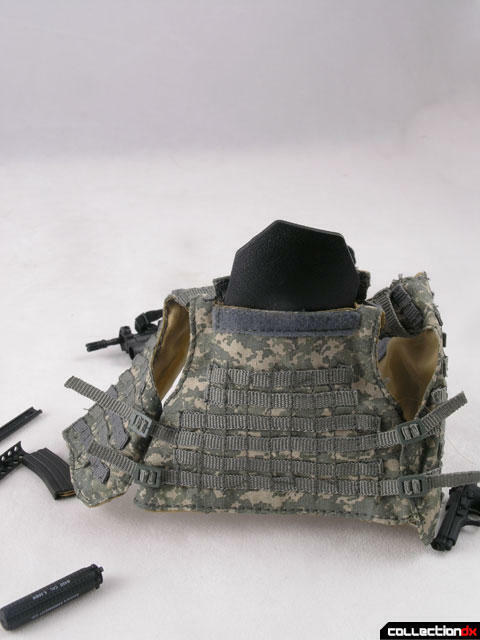 There is also a vest that has a pocket in it that you can insert a piece of body armor! The outfit fits appropriately and is removable. This figure has no undergarments - no underwear, t-shirt or bra. For a figure that strives to be so realistic, I find this a glaring omission. The underlying figure is incredibly articulated, with multiple points of articulation at each joint. Articulation is definitely not an issue here. Unfortunately, these figures are meant to be displayed and not played with, so articulation is a moot point. The real selling point here is the accessories. This figure as a ton of accessories and weapons - so many that I found it hard to outfit the figure with all of them at once. 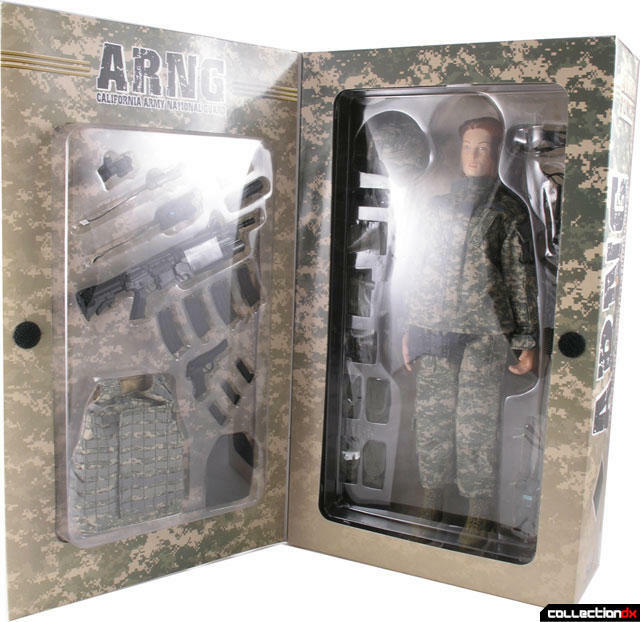 Another drawback here is that you only have the photos on the box as reference - there is no instruction sheet telling you what each part is or where it is supposed to be located on the soldier. This is a major inconvenience for the novice figure collector. It makes the figure less accessible to the first-time buyer. First off is the helmet - the helmet is hard plastic covered by a cloth coating. The straps on the helmet really adjust and I had a hard time getting the straps to go in the right place at first, but through trial and error I figured out. The helmet has a black clip in the front center but I could not figure out what is supposed to clip on there. The figure also comes with a set of clear protective goggles that rest at this point on the helmet, so perhaps that is its purpose. The vest features all these tiny pockets that allow the add-on packs to be attached to. Each pack has a clear plastic tab that looks like an upside-down letter U that slides into the pockets. You can arrange the packs in any method you choose. Each pack opens and is stuffed with paper from the factory. One pack is larger so it can fit the radio unit in it. The radio unit is a complicated little part. It consists of a headset that fits under the helmet, a handheld unit, and a small part that looks like a microphone. These are all connected by flexible wires that can be attached to the handheld unit. 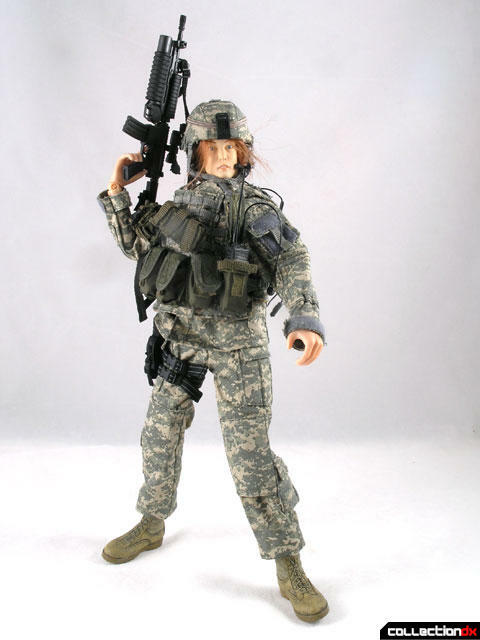 In terms of armament, the figure comes with a large rifle that could have a whole review just to itself. It features moveable parts such as an extending stock, removable ammunition clips and what looks to be a grenade launcher under the barrel. The top part of the barrel also features 2 removable panels that can be replaced with slightly different looking panels. I'm sure the gun experts know what all this is, but due to the lack of documentation, I am clueless. At the top of the rifle is a connection point at which you can connect a variety of attachments, including a scope. The scope is tiny, but still features opening front and rear lens covers. The rifle also features an adjustable cloth strap. Also included is a pistol with three clips, as well as a holster that is secured to the leg. 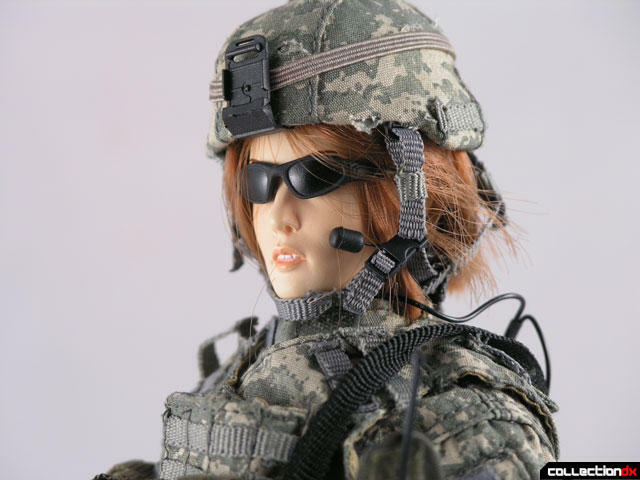 In addition to the above accessories, the figure includes sunglasses, boots, and two items with antennas that I cannot identify. They look like they might attach to the rifle, but I am not sure. Needless to say, the figure is not lacking in accessories. The packaging is pretty nice, with a fold-out cover secured with Velcro. Inside the front cover is a plastic panel with a majority of the accessories. The panel has to be cut open to get to the accessories, thus keeping you from being able to keep the package intact. The figure itself rests inside a plastic tray along with the rest of the accessories. All in all this is not a bad figure but I think it could be made more accessible to the first-time buyer by the inclusion of an instruction sheet or manual. You can find this figure exclusively by Merit International. I just finished reading your Makoto Kusanagi review and I felt some deja vu. Another doll looking figure thta is actually for boys.